Region – Avidia Bank recently donated $1,000 to the Robotics Team at Assabet Valley Regional Technical High School. 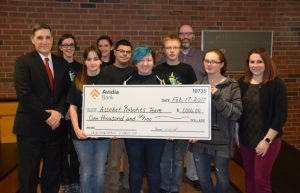 This donation will be used to help defray the cost of building this year’s robot to compete in Rhode Island and Bridgewater. Avidia Bank is a $1.35 billion mutual community bank, headquartered in Hudson, with branches in Hudson, Westborough, Clinton, Leominster, Marlborough, Northborough and Shrewsbury.